I am not big into names. It doesn't really matter to me whether 7...Bf5 versus the fianchetto King's Indian Defence is called the Lesser Simagin Deferred, or nothing at all. I couldn't care less whether you call 1.g3 Benko's Opening, or something else entirely historically accurate. Call it whatever you like; it doesn't matter to the moves, to the intrigues generated on the board. But there is a manoeuvre in chess that time and time again sets my heart a-flutter in chess, and I would like to know what to call it. And it's not some esoteric theme glimpsed only in studies, but something simple - if uncommon. I find the act of putting the queen en prise one of the most beautiful things in chess; that is, offering her for sacrifice without capturing anything. When it's done soundly, of course. 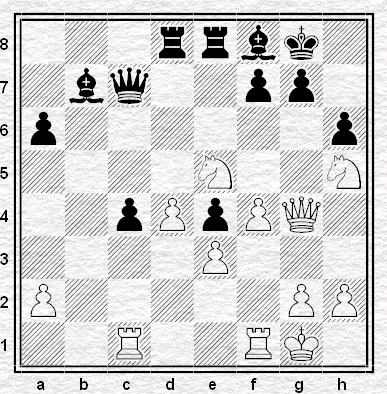 An example from a recent newspaper article can be found in the diagram on the right, where it's white to play and win. Why do I find it so beautiful? I have no idea. Maybe because I typically fail to spot these tactics, and if you suffer similarly then just hover the mouse over the diagram for the solution. Of course, I know full well that others enjoy this theme. That the almost ninety-year-old (possibly constructed) game Edwin Ziegler Adams versus Carlos Torre-Repetto is still famous and celebrated proves as much. What to call such a manoeuvre? The only term that springs to my mind is The Queen Waft. For my part on the board, I'm glad to say that when an on-line blitz game presented me the opportunity to waft my own queen, I took the chance to make a small contribution in this little corner of chess beauty. White to play and win more than an exchange and a pawn. Again, if you want the solution, just hover the mouse over the board. Why do I want to give it a name? Maybe to make it easier to find other examples. Maybe because I think such moments deserve to be recognized as a bit magical. Why do I find such really quite simple moments rather special? I have no idea. Questions, questions, questions. Two more: can you think of a better name than Queen Waft? Any further examples to share? I also find this kind of move very beautiful. There is a famous ...Qg3 by Marshall against Levitsky which also springs to mind, where Marshall puts the queen en pris to 2 pawns! I think there is something beautiful and artistic about a move that on the face of it seems implausible. It's this ingenuity and the brashness of the move in overcoming the complexity of the game that seems to raise it to the level of artistry. The Queen seems to have no right to be there, like Johann Cruyf turning a defender or Roger Federer hitting a cross court winner from an inconceivable angle. The late Jerry Hanken coined the term 'Parting with the Lady'. I presume the answer is 1.Nf6+ Kh8 2.Qg6. Bravo. The word 'waft' seems quite apt if you compare the move to a magic trick- 'wafting' a playing card in front of your eyes. this type of sac is known as the 'silent' sacrifice in 'How to be a deadly chess tactician' by David Lemoir. Seems quite apt. I am reminded of a position I had against Brian Gosling once, in the Reinfeld Memorial tournament. 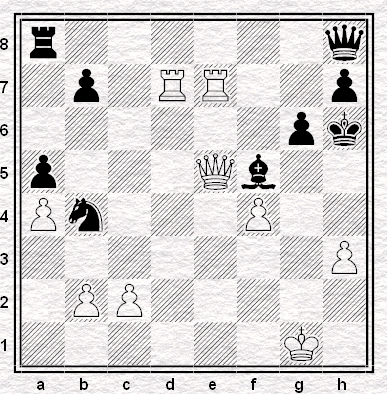 Gosling (white, to play) threatened mate with 1.Bd8. I think he'd missed my response. Thanks for the interesting responses. I like 'silent'. It's probably an upside down FEN. Treat it as 1. ... Bd1, threatening mate on e2.